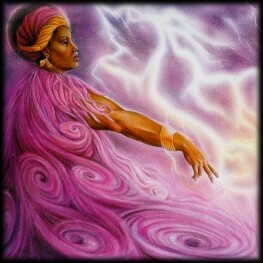 Oya is one of the most powerful African Goddesses (Orishas). 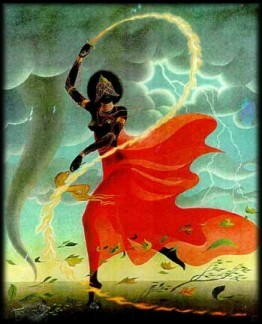 A Warrior-Queen, She is the sister-wife of the God Shango, to whom She gave the power to create storms. Much of Oya's power is rooted in the natural world; She is the Goddess of thunder, lightning, tornadoes, winds, rainstorms and hurricanes. A Fire Goddess, it is Oya who brings rapid change and aids us in both inner and outer transformation. Oya is the guardian of the realm between life and death; as such, She is not only the Goddess of spirit communication, funerals and cemeteries but also the Goddess of clairvoyance, psychic abilities, intuition and rebirth. She can call forth the spirit of death, or hold it back -- such is the extent of Her power. . Because of Her affiliation to the dead, and Her intense knowledge of the magick arts, Oya is also known as "the Great Mother of the Elders of the Night (Witches)". Oya is the protectress of women and patron of feminine leadership. Fiercely loving, She is wildly unpredictable and can change from benevolent, caring Mother to destructive Warrior in the blink of an eye. Passionate, fearless, sensual and independent, Oya is not a Goddess to be invoked lightly and must be treated with respect and care. While She will toss you in Her storms of change, and shelter you in Her caring embrace, She will also strike you down with Her lightning should the need arise. However, do not let that dissuade you from working with Oya, for She is the Strong Woman, the Bringer of Change and Seeker of Truth, who can be a most powerful ally. Colours: maroon, purple, deep dark red, oranges, browns, multi-colours, burgundy, copper. Gemstones: red stones, particularly garnet, but also bloodstone, tourmaline, smoky quartz. Foods: eggplant, grape wine, grapes, gin, rum, kola nuts, rooster, hen, porridge, fruit, fish, anything spicy. Herbs: comfrey, pleurisy roots, horehound, chickweed, peony, elecampane, royal poinciana, star apple, flamboyan, yucca, caimito, cypress, grains of paradise. Icons: masks, swords, whips, pennies, brooms, camwood, wind instruments, anything associated with wind (e.g. pictures of hurricanes, tornadoes, etc), bright-coloured cloth, buffalo's horns, anything copper. Oya's taboos are smoke, palm kernel oil, ram and pork. Requirements: Dark red or purple candles, sandalwood incense, an offering to Oya, pen, paper and dark red or purple ribbon. Hail, Oya, Lady of Storms! Once you feel Oya's presence, sit and talk to her (aloud or silently, whatever you're comfortable with) about the changes you would like to make in your life. These could be small changes or large changes. Focus on the positive aspects of these changes. Pause after each change to hear Oya's words of aid and wisdom. Then think about each change and how you're going to achieve it. On the paper, write down the first change you want to make. Then, once you have listened to Oya and considered your actions, write down how you're going to achieve this. Then determine a realistic timescale and make a note of that, too. Then move on to the next change. When you've finished writing out the changes, actions and dates, read your list aloud. As you do so, visualise yourself making these changes successfully. When you come to read out the dates, pledge them to Oya using the following format: "I, [name], pledge to complete this change by [date], in the name of Oya, Lady of Storms and Change." When you have finished reading aloud, roll up the paper and tie with the ribbon. Carefully drop some wax from one of the candles on top of the ribbon's knot to seal the package. Place this on your altar as a reminder. Your wise words, listening ear, and instigation of change. Take up your circle in your usual way. Should you need an extra boost while you're completing your changes, or want to instigate some more, then you can use this ritual again to call on Oya's powerful energy. 1. Marashinsky, Amy Sophia. The Goddess Oracle: A Way to Wholeness through the Goddess and Ritual. Element : Boston (1997). 2. Ann, Martha, and Dorothy Myers Imel. Goddesses in World Mythology: A Biographical Dictionary. Oxford University Press : New York (1995). 5. Personal Meditations and Rituals with Oya.